There are many kinds of senior tracker apps designed to keep tabs on elderly users, but there is nothing quite as good as the Senior Safety App. This unobtrusive, easy to use, and affordable safety alert app for seniors is chock full of features—from GPS location monitoring to fall alerts and inactivity notifications. It’s a cost-effective solution for those who are looking for a tool to help them ensure the safety of their elderly loved ones. The Senior Safety App offers complete location monitoring solutions with geo-fence alerts and with live location tracking, you also know exactly where the senior user is 24/7. Are you worried that your elderly parents might wander around aimlessly or miss their appointments with their physicians? Use this app to get alerts whenever they enter or leave certain geographical areas that you assign—such as their neighborhood or the doctors office. This senior tracker also lets you know how often the user visits certain addresses, as well as their speed and routes. Such data has many useful applications. It can show you whether your parents are getting enough exercise and are going to their doctor on schedule. The Senior Safety App uses GPS (or global positioning system) technology that is already built into modern smartphones, and then makes sense of the information it gathers. This same technology is widely utilized in medical monitoring and safety alert for seniors these days. GPS turns a phone into a navigation and location monitoring device—and ultimately into a life-saving tool. 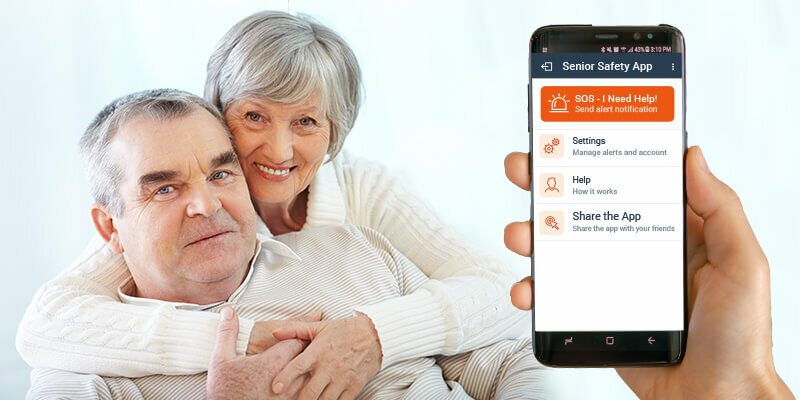 Coupled with the Senior Safety App, GPS technology allows you and the police or emergency personnel to find your elderly loved ones almost immediately wherever they are, the moment they need help. The Senior Safety App can provide instant feedback regarding the daily patterns and whereabouts of the elderly user. Your loved ones can retain their independence and feel a sense of freedom—you never have to constantly call them to ask where they are. They can be confident knowing that help is always on hand, and you can sleep soundly at night knowing that the senior tracker is working 24/7 to summon emergency assistance right away. Are you worried about costs? Don’t be, because the Senior Safety App is very affordable. Basic SOS features are free for life, and premium features are available for just $4.50 a month or $45.00 a year. This economical app has all the features of a more expensive gadget without the unnecessary costs. Should you be unsatisfied with the service for some reason, simply cancel—no questions asked.